Very handy for the autoroute on our way South. The usual excellent Campanile buffet for breakfast. Also available for starters & desserts for the evening meal. We were in a better room away from the busy access road to the motorway. We select this hotel because of it's location close to the Conference centre we visit three times a year and we stay for only one or two nights maximum plus it has it's own restaurant. Bed was good and heating worked well on a cold night. Simple accommodation, but fine for an overnight stay. Very close to motorway. Campanile are well known as a chain for providing good quality dining at a reasonable price. The food and restaurant staff at this one are exceptionally good and there is a terrace/garden you can dine outside at in decent weather. It shares a secure off road car-park with another hotel and there is always adequate space for the car. It's in a commercial estate which shuts down at 6pm so you're not troubled by roads noise and all rooms are accessed directly outside with double glazing and door porches . Immediate easy access to the autoroute network . Nice quality bedding and good climate controlled air-con. Immaculately clean bathrooms with limitless hot water. Wi-Fi a bit tempremental but that's France ! There is a beautiful state of the art boulangerie within 2 mins drive if you want to buy a picnic ! Breakfast was brilliant. Manager was very helpful and friendly. Located near the A20 motorway, this Campanile hotel is just 5 miles from Montauban's town center and train station. It offers air-conditioned rooms and free WiFi access. Rooms at Campanile Hotel Montauban are equipped with a telephone, flat-screen TV and private bathroom. 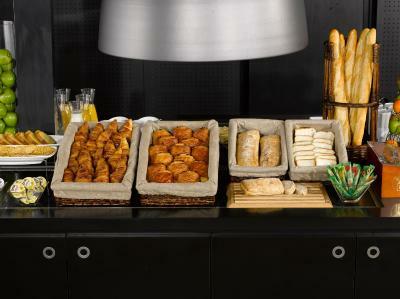 A full breakfast buffet is served daily at the Campanile Montauban Hotel. The hotel’s air-conditioned restaurant offers traditional cuisine for lunch and dinner. Additional facilities include a garden and terrace with a children’s playground. The Campanile Montauban is 31 miles north of Toulouse and 41 mi from Cahors. It is near the Pente d’eau de Montech and guests have access to free private parking. When would you like to stay at Campanile Hotel Montauban? These air-conditioned rooms have satellite TV and an private bathroom. They also have tea and coffee making facilities. House Rules Campanile Hotel Montauban takes special requests – add in the next step! Campanile Hotel Montauban accepts these cards and reserves the right to temporarily hold an amount prior to arrival. Guests must arrive at the hotel before 11 pm as the room cannot be guaranteed after this time. If you cannot change your arrival time, please contact the hotel before 11 pm local time. We have to leave early in the morning and at the weekend the times of opening for the restaurant are too late for us to get Breakfast. The noisy and more worn rooms at the back of the hotel get filled first and we usually have one of these rooms that are in bad need of refurbishment. Once we got in we were speechless. The room was smelly, had broken lamps, paint coming of the walls and broken things in the bathroom even spider webs. After a couple minutes looking for the single bed we found it on the dusty floor under the double bed. On the top of all this we had no pillows on the bedroom and bathroom ware including towels only for 2 people. At the end I have been charged around 67€, Which if you ride 5 minutes more you pay less and get a great deal comfort/cleanness/customer service. Room looking a little tired but fine for an overnight. Old facilities. Dirty. Noisy and next to motorway. Bad smell in bathroom. Bad mattress. Room was really uncomfortable. I could not find any clean silverware in the restaurant tray for breakfast. This hotel needs total renovation. Staff was kind, helpful and very polite. The location was next to a busy road with heavy traffic noise all night. The hotel was an old Motel style building with rooms opening onto an open balcony corridor. Some guests smoked on the balcony with cigarette smells entering the room. The building was tired and in need of an upgrade. Pillows were disgraceful. Very poor shower over bath with curtain too short so floor got wet. Bathroom fan did not turn off. Had one used pillowcase on the bed, No spares in cupboard. Food minimal choices. Staff inattentive.